Имате въпрос към Catba Dream Hotel? Ако това, което търсите е хотел с добро местоположение в остров Кат Ба, не се колебайте, а изберете Catba Dream Hotel. Този 2.5-звезден хотел е леснодостъпен, тъй като е само на от летището. С удобното си местоположение хотелът предлага лесен достъп до всички градски забележителности, които задължително трябва да се видят. Съоръженията и услугите предлагани в Catba Dream Hotel гарантират Вашия приятен престой. За удобството и комфорта на гостите хотелът осигурява 24-часов рум-сервиз, безплатен WiFi достъп във всички стаи, 24-часова охрана, магазин за подаръци/сувенири, 24-часова рецепция. Catba Dream Hotel разполага с 30 стаи, които са обзаведени с вкус. Много от тях предлагат удобства като телевизор с плосък екран, безжичен интернет достъп (безплатен), климатик, бюро, минибар. Освен това в хотела можете да се възползвате от множество предложения за приятно прекарване на свободното време. Когато търсите удобно и комфортно място за настаняване в остров Кат Ба, изберете Catba Dream Hotel, който ще се превърне във втория Ви дом. Отель расположен очень хорошо. рядом на набережная, пристань и кафе с ресторанами. Внимательный персонал, говорят на английском. Можно купить билет на автобус до Ханоя и на экскурсии. Убирают номер каждый день. Кровати удобные. Есть кондиционер и вентилятор. Я останавливался на 2 ночи и этого вполне хватило чтобы осмотреть весь остров. Не надо далеко искать, цена-качество отличное. Вода горячая, кондёр, вай-фай,, много места. Плохо что нету чайника, внизу термосы, но он не особо нужен. Весь расчёт по отъезду, а там не помнишь, что по пьяни покупал а что нет, но это таким как я плохо Некоторые жалуются на матрасы, на мой взгляд самое то, люди которые занимались физическим трудом и имеют проблемы со спиной оценят. .
По русски персонал не говорит. We stayed here for 3 nights and 4 days. Check in was fast and easy and the owner was super friendly. We booked this room because it was close to the seafront and heard amazing reviews about the view. Beside the view, everything was bad. Cat Ba Island is in its winter / low season so therefore not many tourist around therefore construction everywhere. Do not stay here if you want a quiet and relaxing time. You can stay here if your not in your hotel from 8am- 6/7pm. But stay away from the seafront area. Loud music coming from seafront restaurants (weekends). There was construction on our floor (5th floor) and (6th floor) that started as early as 8:28am -6pm everyday. This includes drilling, hammering as well as bashing. Downstairs on the right hand side of street had construction going until 7pm and started as early as 9am. The room itself was ok. Bed was comfy and we had a duvet each (double bed). Always had Hot water in the shower and good working AC and fridge. No bin in the main room (only in bathroom). Sink was always leaking/dripping and we saw one cockroach crawling up the sink in the middle of the night and a few ants in the bathroom. The walls were not soundproof. The lift was occupied with constructions/wood most of the time. Upon checking out the owner apologised for the constructions and the noise everywhere and gave us free water each. I don't recommend to visit Cat Ba island after Vietnamese's new year. My Hanoi's friend told me, after the new year end, the crime is increasing and the security is not safe after all. Especially for whom planning to have solo trip. The restaurant around the city seems close due to it is not the season when local people visiting. Everything tend to be expensive and not tasty at all. We stayed at Cat Ba Dream Hotel for 3 nights & can't speak highly enough. The staff/owner is so friendly and happy to happy to help you with tours/motorbikes (even decreased the price as it was cheaper elsewhere). Make sure you book a room with a sea view & on a high floor as the view is amazing. The rooms are great. Everything was above expectation for the price we paid. We also booked a boat tour through the hotel for 16US$ and it was a great day. I stayed here for a week I liked it so much. The manager & staff were so kind & welcoming. My room was cleaned everyday. The bed was amazing and the view of the harbor from my room was amazing. I can't reccomend this hotel enough. I will definitely stay here again. I stayed for 2 nights. Upon arrival and the next day, electricity to the island was cut off. This was fine as the weather was cool and windy, but due to the fact that I chose a seaview facing room, the setting sun meant my room was rendered very uncomfortable without air conditioning. The unreliable electricity also meant that my phone couldn't be charged, or have hot showers in the cold North Vietnam weather. This meant the lifts were not working too, so good luck if you, like me, was assigned a 6th to 8th floor room. The view of the harbour and sea from my 6th floor room was beautiful, and shops and eateries were within easy reach. When I came down with food poisoning, the owner/staff were very helpful by taking me to the nearest pharmacy for medicine and assisting in translation. We loved our stat ay Cat Ba Dream, and wish we could have stayed for longer!! Everyone at the hotel was so kind and helpful, and we booked all our tickets directly through them for great prices (Ha Long Bay boat, sleeper bus, etc)...it was effortless, and saved us so much time. Such a central location too. And wow the room!! Probably the best we stayed in during two months in Vietnam...such an incredible view of the bay, and an unbelievable value!! Thank you Cat Ba Dream!! The room is very nice and clean, with an amazing view to the bay. Would highly recommend this hotel we stayed for 2 nights in total, would recommend getting a sea view room as the views were amazing. Really good value for money. Hotel manager was very helpful and helped sort out our trips and getting to our water villa on Ha Long Bay. Central location and nice, helpful staff. The room was OK for the price, but it could get very noisy at night, so bring your earplugs. 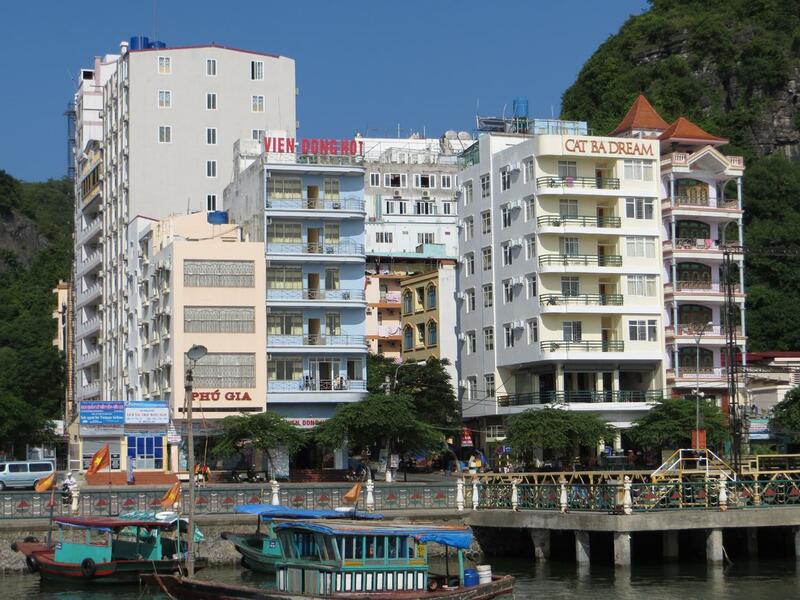 When we were deciding whether to go to Ha Long or Cat Ba or do a cruise and stay on a boat, we saw a special deal for a sea view room at this hotel and decided to take it for four nights. It turned out to be one of the highlights of our whole trip. The view was magnificent and the room had everything we needed for us to be comfortable (though a kettle would have been good - the electrics weren't brilliant and we had to buy another adaptor to charge our phones) but these are minor details. The staff were fantastic and went out of their way to be friendly, helpful and informative., especially the manager (Keith?) who always went beyond the call of duty to ensure everything went smoothly for his guests. The whole of Cat Ba had a relaxed friendly vibe - no hassling to buy anything- so we were able to just chill. The beach and Cannon Fort with its magnificent views are all walking distance - if you feel like the exercise and the tours offered by the hotel are reasonably priced and great value for money. We did a full day trip on a boat to Lan Ha and Ha Long bays, including stops for swimming/snorkelling, lunch, kayaking and a stop at Monkey Island where you could do a climb or just chill on the beach. This was one of the highlights. But I think the other tours to the national park etc. were equally good value. I could have stayed here for much longer and really enjoyed our time here. The only drawback is that it was such a central location opposite the main harbour and town square, that if there was a festival or event happening ( which we were privileged to have been around for) then it can get very noisy if you wanted to get to sleep before the celebrations were over. Overall, we couldn't recommend this place more highly. Lovely hotel with great views. The twin or double with Seaview is worth it! Kid was the host and super friendly and helpful the whole time. Just the beds are on the harder side but otherwise perfect. The staff was really helpful, excellent. They booked us boat cruise and bus tickets for a good price. The view of the sea from the top of the hotel was brilliant. I would recommend this hotel for a couple of nights.